You are here: Home / Ethnic Groups / The People of Sumatra / Who are the Simeulue? The Simeulue people live on an island included in West Aceh Province, Indonesia. Simeulue Island is about 120 km in length, and many of its inhabitants share kinship ties with one another. Sinabang is its largest city. Small towns and villages line the coast. Kampung Aie is one of the most important towns, serving as the center of Islam and the more refined dialect of the Simeulue language. “Mae o?” (Where are you going) is one of the most commonly asked questions on Simeulue. The residents designate the three locally-spoken languages by how this question is asked in each language. Simeulue is spoken in 5 of the 8 subdistricts and includes 2 dialects. Sibigo is spoken in the subdistrict of Alafan, on the western end of the island. 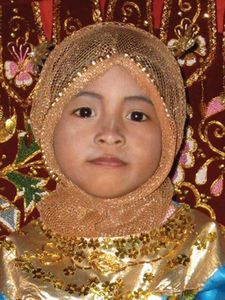 It is related to the language spoken on the island of Nias. Jamu is spoken in Sinabang. It is similar to the Minangkabau language of West Sumatra. What are they lives like? Fishing and farming form the people’s livelihood, with lobsters and cloves being their main exports. Originally the island was named “Ulau U” (Coconut Island) because of its abundance in coconuts. Recently coconut and palm oil factories have been set up, providing extra income for women and children. There are 14 different words for coconut in Simeulue language, each describing a stage of the coconut’s life. Rarely is a meal or dessert prepared that does not include coconuts. In 1907, many lives were lost in a tsunami when people ran out to grab exposed fish on the beaches. From then on, oral tradition passed down this warning: “if the waters recede, run for high ground.” In December 2004, the epicenter of the 9.3 earthquake that caused the disastrous tsunami was just off the coast of Simeulue. They all ran for high ground and were spared. Sadly, people watched from the high ground as their homes and belongings were washed away. Today most of the people live in homes that were built by non-profit organizations after the tsunami. Although built as “temporary” homes, they have been made permanent, expanding behind the houses to whatever size necessary. There are three types of living arrangements after marriage. In the first pattern, the couple lives near the husband’s family. In the second pattern, the couple lives for a few years with the wife’s family and the husband must help his in-laws. After this, they live with the husband’s family for the rest of their lives. In the third pattern, the couple always lives with the wife’s family and the husband must help his in-laws. This usually happens in cases where the wife is an only child. The Simeulue people proudly claim to be 100% Muslim. The historical stories of how Islam came to the island are held in highest esteem. While devoutly Muslim in name, Simeulue people often still fear the spirit world. They still perform sacrificial rituals to appease the spirits, regardless of how often they visit the mosque. For most practical issues, the shaman are the ones they trust. A crisis in the governmental administration of the clove market has shaken Simeulue’s economy. They need other trading and employment opportunities to improve their economy.